Schooner Ami is the only two-masted topsail schooner in Japan open to the public and providing public sails. Built in November 1990 in Numazu City, Shizuoka Prefecture, she was originally designed for a private company as a sail training ship, aimed to train employees so as to develop their leadership and communication skills. Later she was gained by Captain Tamari and named “Ami”, and today she is operated by him along with many volunteers who support him. Schooner Ami offers day sails and three-day short breaks on Suruga Bay, as well as summer voyages to Seto Inland Sea. More than one hundred people get hands-on sailing experience on board her every year. Charters for schools and corporations are available, and also sail training programs for hight school students. Numazu City, where schooner Ami lays her anchor, is located between Mt. Fuji, the highest mountain in Japan, and Suruga Bay, the deepest bay in Japan. With Mt. 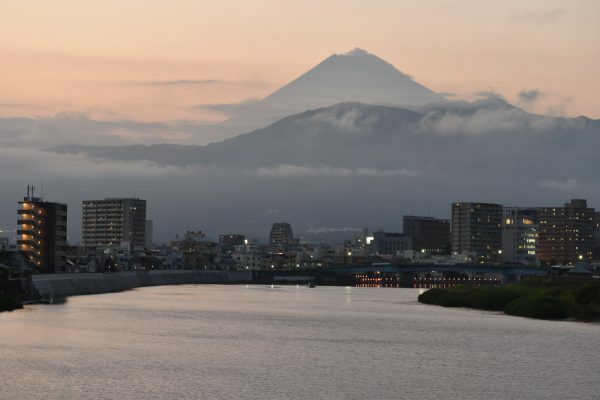 Fuji in the background, Suruga Bay is known for its beautiful scenery, and is among members of “the Most Beautiful Bays in the World Club”. In the east of Suruga Bay, Izu peninsula reserves Izu Peninsula Geopark, which is designated as UNESCO Global Geopark in 2018. Blessed with a rich natural environment and a mild climate, the city has taken the central role of the area in political, economic, and cultural activities. There is a variety of industries such as a wide range of fresh seafood, agricultural products e.g. mandarin oranges and green tea, tourism, commerce and advanced technology developments. Through the middle of the city flows Kano River. The landscapes had attracted and affected authors for their writing life, and numbers of great literary figures created pieces based in the place. The historical relationship of Numazu City with Russia dates back well over 150 years ago. In 1854, Russian fleet, commanded by Y. V. Putyatin arrived at Shimoda Port. Putyatin’s mission was to demand Japan to open its ports with Russia. However, the fleet was badly damaged in the midst of a disaster of major earthquake and tsunami, and the flagship Diana was shipwrecked on its way to Heda, where she was going to be repaired. Around 500 crew members escaped and survived, ended up forsaking Diana. After Treaty of Shimoda (the first treaty between Japan and Russia) was concluded, Putyatin asked the Tokugawa Shogunate (the last feudal government, known for the Edo period) for permission to build a new ship, and the Shogunate allowed the Russians to stay in Heda and decided to help them return to their country by building a ship. Local shipbuilders and the Russian sailors collaborated and built an 80-foot, 80- ton two-masted schooner in two months. The vessel was named “Heda”, in honor of the village that supported the construction of the ship. Schooner Heda was the first-ever Western-style ship built in Japan, and to be the prototype of larger ships produced in the last years of the Tokugawa Shogunate afterward. We are deeply impressed that Schooner Ami, based in Numazu City that includes Heda in its domain, takes part in the “SCF Far East Tall Ships Regatta 2018” in the year of “Japan Year in Russia”. We believe that Ami’s participation will promote cultural and people-to-people exchanges between Japan and Russia. Copyright © 2018 帆船Ami　schooner All Rights Reserved.